It’s layers of peppers, onions and fries may evoke greasy spoon diners but this sausage hoagie is as healthy as it is tasty. The star of the show is the hearty, artisan Italian Grain Meat Sausage by Field Roast Grain Meat Co. Bake the well-seasoned fries instead of deep-frying, and drizzle some extra-virgin olive oil over the hoagie rolls to add healthful flavor. Bake the fries: Preheat the oven to 450°F. Spread the fries out over a large baking sheet, drizzle with extra virgin olive oil, and sprinkle with kosher salt and freshly ground black pepper. Toss. Bake for 20-25 minutes until golden brown. In the meantime, cook the peppers and onions: Lightly salt the peppers and onions, and begin to fry them in an oiled pan. Continue to cook, tossing occasionally, until the onions are translucent and the peppers are soft. Brown the sausages: Add the sausages to the onions and peppers and heat them (they should be nicely browned and heated through), about 5 minutes. Add extra vegetable oil if the pan is too dry. Once the peppers and onions are cooked and the sausages are browned, turn off the heat and add a generous layer of fried peppers and onions to each sliced hoagie roll. 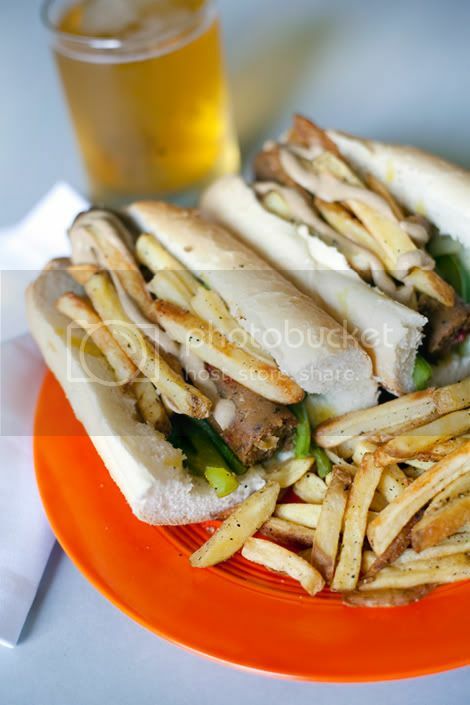 Add sausage (one per hoagie) and top with fries and Dijon mustard. Serve immediately. For more info about Field Roast Grain Meat Co., visit FieldRoast.com.